The self-study process for Washington Adventist University in Takoma Park, Maryland, U.S.A. (formerly Columbia Union College)4 began in 2012. The university was given 10 criteria to address under Form B. Institutions that use Form B have a long history of accreditation by AAA, are recognized by a regional accrediting body, and have a track record of adhering to church educational policies. Seventh-day Adventist institutions that are new to the AAA process will most likely be evaluated under Form A, which requires a lengthier process. WAU was evaluated using the 10 criterion categories included in Form B at that time (see Table 1, Form B). In 2013, the General Conference Department of Education significantly reduced the number of Form B areas from 10 to seven (see Table 2), which decreased the time required to prepare the self-study document. WAU, however, had already made significant progress into its self-study evaluation, so the school adhered to the original self-study plan. The president of Washington Adventist University (WAU) asked if I would take the leadership role as the chair of the school’s AAA self-study committee. I agreed and was given the AAA guidelines. Accepting the role of AAA self-study chair meant my workload and time commitments would increase over the next year. The chair coordinates and keeps track of all the details necessary to produce a well-written AAA Self-Study report, and makes plans for hosting the AAA visiting team. The visiting team is typically comprised of the General Conference liaison (chair), the division director of education/vice president for education or designee (recording secretary), the president and board chair of the institution, peers from Adventist colleges and universities, and others in consultation with the chair and division director. In order to coordinate and manage the self-study process, the first several months were spent organizing the steering committee, deciding on the composition of the various subcommittees, developing and constructing a timeline for the entire project, and forming the executive committee. 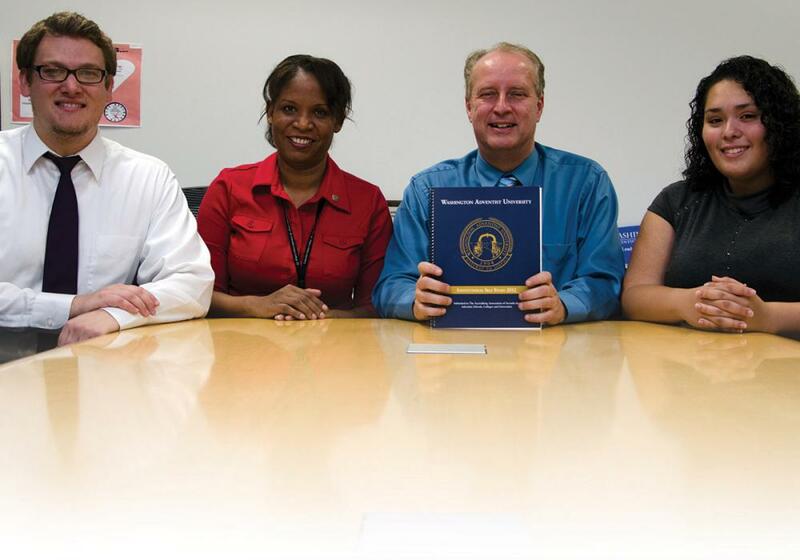 While it took 13 months of planning, researching, writing, and editing to produce the finished AAA Self-Study, our ability to complete a successful report was enhanced when WAU’s regional accrediting body, the Middle States Commission of Higher Education (MSCHE), found us to be in compliance with its 14 standards. Many of the resources we needed for the AAA Self-Study were also reviewed and gathered by our previous MSCHE self-study team such as: MSCHE Self-Study report, faculty/staff handbook, board minutes, course syllabi, student handbook, general-education assessment report, the university’s audited financial statements, governance procedures, campus master plan, athletic handbook, facts and figures booklet, and various public-relations brochures. However, the AAA Self-Study report made use of those supportive resources differently than the regional MSCHE report (see Table 3). In addition, the AAA Self-Study report included the university’s spiritual master plan—which outlines the goals for spiritual life and development on the campus, and a report on the plan’s impact on the lives of students, faculty, staff, and the wider community through the curriculum, service, and witnessing. I found that the chair had a number of responsibilities. He or she must make frequent reports to the institution’s administration, who need to be informed about all committee decisions and should receive the minutes of all meetings. As chair of the AAA self-study committee, I created the minutes for each meeting and then circulated them by e-mail to the administration and all members of the steering committee. Another important assignment for the self-study chair is to plan for a successful visit by the AAA team. This included making appropriate hotel accommodations, arranging transportation from the hotel to campus meetings, scheduling daily meals, providing adequate campus workspace, and scheduling on-site meetings with administration, faculty, staff, and students, which required collaboration with various administrative officers and staff, the school’s food-service director, and campus security. Figure 1 provides insight into the amount of time required to complete the AAA research and writing process by the various committees. An objective and accurate self-study report should reflect a campus-wide evaluation rather than the work of one individual. A balanced report will result from participation by a cross-section of the students, staff, and faculty. Once we received the criteria and the associated questions, I chose a steering committee composed of 10 individuals to oversee the research and written responses for each of the AAA criteria. One subcommittee was created for each of the 10 criteria. Each steering-committee member was assigned to write one section of the Self-Study report and to review the work of fellow committee members. The steering committee thus engaged in a review process for every section of the Self-Study report and provided feedback to each steering-committee chair regarding suggested improvements, changes, or additions. I invited the university’s institutional-research director to be a member of the steering committee. An individual filling this position will be able to procure self-study resource materials quickly, which will lessen the amount of frustration or delay that the self-study committee might otherwise experience. If the institution does not have such a position, then the chair should select a person who works in the administrative office and is familiar with the school’s internal report-writing process. For the WAU self-study, the AAA self-study chair, in collaboration with the university provost, determined the faculty/staff/student composition for each of the subcommittees. Committee assignments were determined by the nature of the criterion questions and specific background of the faculty, staff, and students. The sizes of the various committees ranged from five to 10 members, depending on the magnitude of the specific criterion. Because we knew that student input would be valuable, several students were asked to be on certain committees such as spiritual development and student services. I obtained a master list of all faculty and staff and became familiar with the skills and talents they possessed. A campus-governance committee list is very useful, as is a departmental faculty/staff phone and e-mail roster. The chair should choose individuals who have the knowledge and experience for the selected criterion areas by virtue of their campus positions and years of experience in that position. Ideally, the self-study subcommittees should represent a broad spectrum of people and programs on campus to ensure a fair and balanced investigation of the school’s programs and departments. The self-study subcommittees will function as a campus fact-gathering mechanism whose mission will be to evaluate, analyze, and make recommendations based upon the responses to the criteria. I tried to be sensitive in the selection process so as not to choose individuals who would be unduly burdened by this extra responsibility due to current work obligations or recent regional accreditation responsibilities. For example, if an individual had chaired one of the self-study groups for the recent regional accreditation (i.e., MSCHE), he or she was not requested to chair a similar committee but instead was asked to serve on a related AAA committee. President appoints AAA self-study chair (August 2011). AAA self-study chair works on organizing steering committee and team members (September 2011 through December 2011). First organizational meeting of the steering committee (January 2012). Self-study teams begin work of research, evaluation, and analysis (January 2012 through May 2012). Monthly meetings are called to get status reports from each team. Steering committee gets drafts from Teams 1 through 10 (by May 31 deadline­). AAA draft revision and editing completed (by August 31). AAA draft report circulated to faculty, staff, students, and board members for comment (September 1 to September 16). Final editing finished and report sent to publisher (September 20). WAU Self-Study report submitted to AAA visitation team (October 1). Site visit by AAA team (week of November 5-9, 2012). Having each subcommittee evaluate one of the criteria is an efficient method to accomplish the task of writing a self-study report. It would be a serious mistake to combine several criteria and have them handled by one subcommittee as a way to reduce the number of subcommittees. The process would be cumbersome, confusing for committee members, and an inefficient use of committee time. It might also produce a dysfunctional committee due to conflicting research objectives. The executive committee is responsible for making all final edits before the self-study is sent to the publisher. While keeping the committee small in size, be sure to include individuals with experience in content/style/editorial work, proofreading/correcting grammatical errors, and who are regularly involved in creating institutional reports and/or academic research. Since the scope of this type of editorial writing requires a significant time commitment, I requested a stipend for this faculty member to compensate for the additional work. The remaining committee members were full-time staff/faculty and received no extra compensation. The executive committee membership was comprised of four individuals, including the chair of the WAU self-study. An executive committee begins its task when the steering committee has finished reviewing the criteria responses. Their primary task is to make final edits so the published draft is coherent and polished. A detailed-oriented person skilled at discovering editorial issues such as punctuation and sentence-construction problems should be included on the committee; however, no one person will catch all the small errors. Individuals responsible for writing the final draft easily become absorbed with content accuracy at the expense of discovering editorial problems. The final step is for the executive committee to contact the publisher and ensure that all work is uniformly completed. Our final published report was 78 two-sided pages of content and 26 pages of appendix documents, graphs, and charts. The document was then ready for the visiting committee to review as they conducted their evaluation. Locate all resource materials. Subcommittee chairs will want to know where to find information about the items included in their specific criteria. If your institution employs an individual who is responsible for producing regional, state, or federal reports, he or she will be an indispensable resource guide. Create a packet containing all needed information for each team. Materials should include the most recent self-study document, AAA’s last recommendations, each team’s specific criteria, and a steering-committee timeline. Produce a cross-listing of all materials used for the regional accreditation with relevance to specific AAA self-study criteria. If your school is regionally accredited, the regional accreditation standards can be cross-matched with AAA criteria. This index will serve as a useful guide for the steering-committee chairs in locating recent regional accreditation report findings. We found this to be very helpful for locating areas already evaluated. Select and reserve a good meeting location with access to a projector, a high-speed Internet connection, and a white board or chalk board. Choose a steering committee meeting time that has the fewest time conflicts with other campus activities and members’ schedules, and keep to it. The AAA self-study chair should develop a reasonable timeline to guide the self-study process. Make sure everyone understands the importance of observing the due dates listed on the timeline. Get everyone to agree to the schedule at the beginning, and try not to deviate from it. Build into the timeline reasonable expectations regarding completion of committee tasks. Construct a schedule that is sensitive to the demands of the academic calendar. Faculty and staff usually find graduation, test weeks, and holiday times stressful, so plan to complete the major portion of the writing during longer break periods such as mid-semester or summer vacation. This will leave time for each chair to finish writing his or her chapter of the self-study and for it to be reviewed by the steering committee. Be sure to build some flexibility into the timetable so self-study participants do not feel rushed or overloaded. Despite careful planning, delays may occur for a variety of reasons, often related to the professional and personal obligations of the subcommittee chairs. The timeline should specifically indicate the time, date, and location of the steering-committee meetings. Plan on getting together at least once a month for a report on subcommittee progress and so that specific questions can be addressed. WAU steering-committee members were particularly interested in knowing where to locate resource material and how to interpret specific criterion questions. However, our steering committee kept to the schedule, meeting every Monday and Wednesday during the summer until we had heard from each subcommittee. Figure 1 provides an example of the timeline that was successfully developed and followed for WAU’s AAA self-study. Strategy 7: Implement an institutional assessment plan and metrics. Matrix of Institutional Goals and Major Accreditors’ Goals, v2 Created by Office of Institutional Research and Effectiveness. AAA Self-Study Form B (2013): http://adventistaccreditingassociation.org/images/stories/docs/aaa_handbook_2013_part_iv.pdf. A decision was made at the beginning to require all of the subcommittee chairs to work on their drafts using Googledocs.com. The self-study chair provided the names of the committee chairs, as well as each team member, to the university’s Information Technology Services (ITS) so they could arrange for access to this service. Googledocs.com was set up to allow each team to access the most current version of their team’s draft. Using a shared space avoids the problems created by having as many versions and flash drives as there are committee members. In addition, this practice avoided the problem of identifying who had the most current working subcommittee draft. Googledocs.com (1) constantly backed up written entries and allowed only authorized team members to view and edit each report; (2) allowed the self-study chair access to each subcommittee’s working document in order to monitor the committees’ progress; (3) allowed each subcommittee chair to present his or her group’s work to the entire steering committee via the Internet; and (4) allowed the steering committee to make comments and ask questions about the work being presented. Since Googledocs.com is an Internet-based program, changes could be made immediately. The main disadvantage reported by some of the subcommittee chairs was that the program was less user friendly than they had hoped. It is important to back up the report as it is being written. Do not take for granted that everything written will be automatically saved by one program. The computer system used for writing the final report should be regularly evaluated by updating the virus protection and making sure all software is working properly. This step is easily overlooked when trying to finish a report on time. A small cost to an institution but highly recommended is a subscription to Carbonite.com, which allows writers to have documents constantly backed up. For example, one subcommittee member made the mistake of not using Carbonite.com at first and instead used an external hard drive for backing up documents, only to discover later that the hard drive was not working properly during an editing meeting with the executive committee. As we attempted to complete the final editing stage, the computer screen froze. Restarting the computer caused the loss of the last section of the document. ITS tried to retrieve the lost section by running a special document-recovery program but without success. The only solution was to re-create that section again by referring to notes and personal memories. Members of the visiting AAA team in the exhibit room reviewing artifacts, consulting and verifying information, and writing their reports. 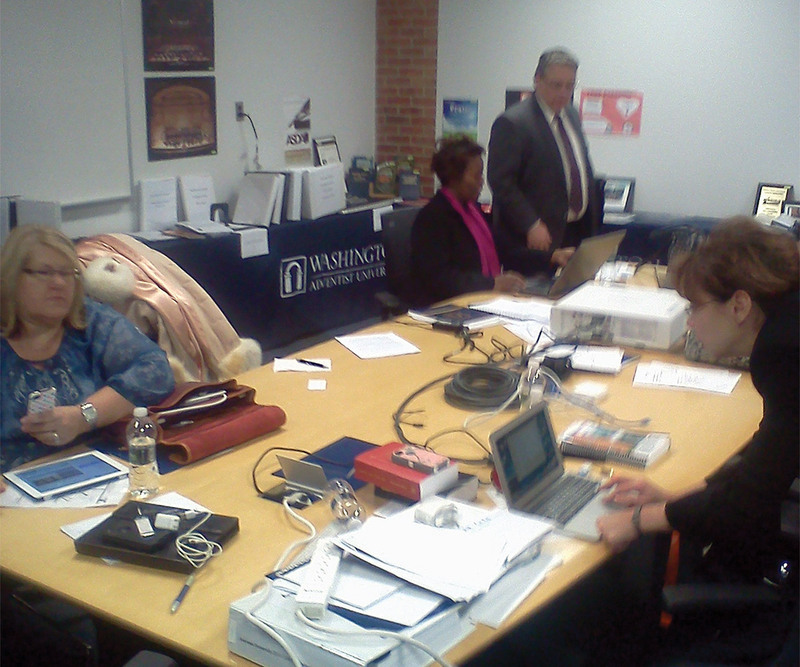 The Washington Adventist University AAA executive committee at work. 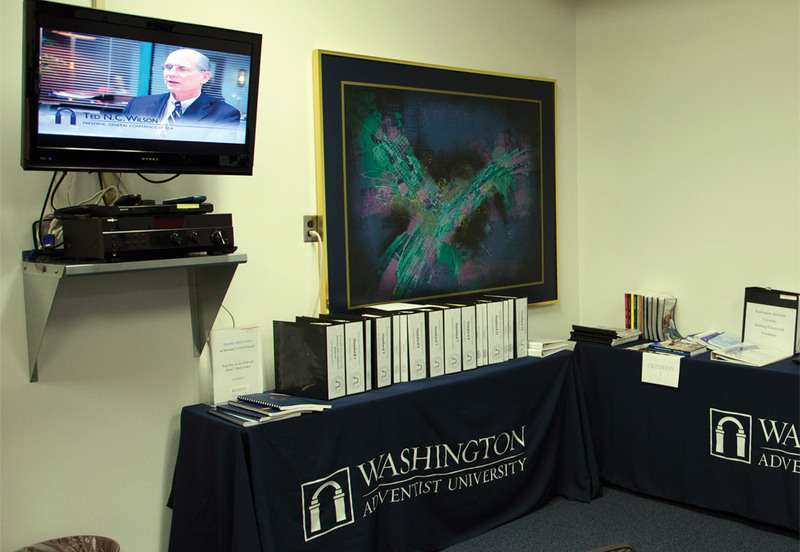 The Washington Adventist University AAA exhibit room displayed and housed artifacts that would assist the visiting team in completing their worrk. An exhibit room is a useful way of displaying materials that are listed in the final self-study report to the visiting committee. The exhibit room speaks to school pride, spirit, community enthusiasm, and institutional professionalism. If carefully organized, it can identify the attributes and characteristics that directly communicate the school’s mission and vision. Our institution’s exhibit room displayed everything needed for the self-study team to read and evaluate. This room included many of the same exhibits used for our regional accreditation visit. For example, we made available all the faculty syllabi, previous regional self-study reports and university board reports. Several laptops played videos of school activities; and we provided a minibar for drinks, snacks, plus a printer and projector. The exhibit room was further enhanced by its display of school colors, mission posters, and the use of embossed tablecloths. Each item in the exhibit room was labeled and referenced in a master sheet distributed to the AAA visitation team. The first meeting with the AAA visitation team was an overall orientation to the exhibit room and how the documents could be accessed. The AAA visitation team found the exhibit room useful as a conference room and workroom to produce their evaluation reports. Sometimes the exhibit room was used to host catered meals for the AAA evaluation team. The AAA report highly commended WAU’s exhibit room as being exemplary in the range and type of evidence presented. Many of the problems encountered during the AAA self-study process were minimized by the steering committee chair communicating frequently with all subcommittee chairs by using an e-mail distribution list. In addition, the self-study work was intentionally organized to allow much of the intense busy work to occur during the summer, when the workload for most committee members was less stressful. Because of the scheduling of the AAA team’s visit, it was important to get much of the work done before the fall semester and to complete all the final editing work on time. AAA specifically recommends receiving the finished Self-Study report one month before the evaluation visit. Overall, participation in a self-study was an informative and lengthy experience. The report was posted on the school’s Website prior to its submission to AAA. This allowed the administration, faculty, students, and board members to respond to it, and strengthened the final report. Once the AAA Self-Study was completed and shared, the campus community gained a better understanding of what the institution had accomplished and which areas the administration would need to address for future improvement. The AAA visitation team made several commendations and recommendations during their exit presentation to the university on the last day of their visit. We were commended for the substantial progress in achieving all major past recommendations and for a well-written narrative report. A major AAA recommendation cited the need for WAU’s spiritual master plan to reflect how the uniqueness of the Seventh-day Adventist mission and message is expressed to the large number of non-Adventist students enrolled in the School of Graduate and Professional Studies (SGPS). The AAA visitation team was particularly interested in how faith and learning was integrated across the curriculum within the programs offered through SGPS. An important component of the self-study process was beginning each steering-committee meeting with a devotional thought by the chair from the book Education, followed by a prayer offered by a committee member. One particular spiritual thought that gave direction and energy to the steering committee was this quote: “In the highest sense the work of education and the work of redemption are one.”5 While obtaining a quality education and a degree are very important for every student, even more important is for every student to personally know Jesus Christ as Lord and Savior. The AAA self-study process is one formal method to determine how effectively the school’s spiritual mission is being articulated to the student population, and each employee’s responsibility to model the same. Examination of the institution’s curriculum, organized campus events, programs, and policies allows the school to evaluate its spiritual mission’s strengths and weaknesses. We were notified by AAA during the spring of 2013 that we had been granted accreditation until December 2017. Our successful AAA report was made possible by adhering to the timeline and working with a supportive administration. Administrative officials provided the self-study chair with a budget, resources, and personnel needed to finish the task. As chair, I felt privileged to work collaboratively with WAU’s faculty, staff, administration, and students to ensure a coherent, meaningful, and high-quality report. 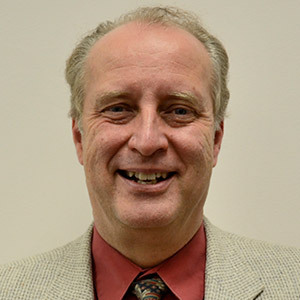 Grant Leitma, PhD, is Professor and Chair of the Psychology and Counseling Department at Washington Adventist University (WAU) in Takoma Park, Maryland, U.S.A. Dr. Leitma earned his doctorate in experimental psychology from the Illinois Institute of Technology in Chicago, Illinois. He has published widely and is a member of the American Psychological Association, American Counseling Association, Maryland Counseling Association, and the Adventist Association of Family Life Professionals. In 2012, Dr. Leitma served as Chair of the Accrediting Association of Seventh-day Adventist Schools, Colleges, and Universities (AAA) self-study committee for WAU and the Middle States Commission on Higher Education (MSCHE) Self-Study report for WAU. Grant Leitma, “How to Plan for an Accreditation Visit From the Adventist Accreditation Association of School, Colleges, and Universities,” The Journal of Adventist Education 79:4 (July-September 2017): 30-37. Available from https://jae.adventist.org/en/2017.4.7. Lisa M. Beardsley-Hardy, “The Purpose and Function of the Adventist Accrediting Association,” The Journal of Adventist Education 70:4 (April/May 2008): 15: http://circle.adventist.org/files/jae/en/jae200870041505.pdf. The Accrediting Association of Seventh-day Adventist Schools, Colleges, and Universities (AAA) serves as the accrediting body for all higher education programs and institutions owned by the Seventh-day Adventist Church. For more information about AAA’s function, see: “AAA Higher Education: What is the Adventist Accrediting Association?” http://adventistaccreditingassociation.org/index.php?option=com_content&view=article&id=49&Itemid=65. For a detailed explanation of the accreditation process, see ibid., pages 15-19. Established in 1904, Washington Adventist University (WAU) was first known as Washington Training College, a liberal-arts institution. In 1907, it became Washington Foreign Mission Seminary, and then Washington Missionary College in 1915. The name was changed to Columbia Union College in 1961. In 2009, Columbia Union College attained university status, and the school’s constituency voted to change the name to Washington Adventist University. WAU was first accredited by the Middle States Association of Colleges and Secondary Schools in 1942. For more about Washington Adventist University, see “WAU History”: https://www.wau.edu/about-us/history/. Ellen G. White, Education (Mountain View, Calif.: Pacific Press, 1903), 30.